With Jeremy Hunt and Alan Duncan keenly poised to overthrow the democratically elected leader of Venezuela, Nicolas Maduro, in order to install a compliant neoliberal one, now is a good time to look at the aid which the Foreign Office has been sending to organisations under the nose of the Venezuelan government. Ideally, the public would expect that any aid resources are distributed on a nonpartisan and neutral basis. However, through exposures of US, UK and EU government support for the ‘opposition’ in Syria, we learned just how determined western governments were to back what were essentially NGO front organisations serving the needs extremist actors, and even terrorists, whose goals were perfectly dovetailed with the sponsors in the pursuit of regime change. With that in mind, it should of considerable concern that a great deal of the UK foreign assistance funds are going to anti-Chavista organisations while the UK government is simultaneously supporting an attempted coup against the Maduro government. This concurrence of events is not merely coincidental – it is standard practice. UK governments have been doing this for years, and often in concert with the US and EU. In certain cases, the ‘Aid’ has been gone to the materially more affluent neoliberal class to enable the spread of their influence and ideas. The following list of organisations has been provided by the British Foreign and Commonwealth Office and is part of what is hoped will be a broader look at all recent foreign aid from the UK to Venezuela. The total budget for this group of programs roughly totals £560,000 spanning over approximately 18-24 months. Although sums might appear to be modest, it’s worth noting that the UK channels its funding through open societies for which there is very little, if any transparency for the public. While amounts may seem small when given to subsidiary groups, they are normally much larger when going to the main body. The UK contribution should also be seen as just rubric in a larger structure of Western funds. Wherever the UK sends money, there is a large amount of EU and US money also, with funds funneled into the same Venezuelan groups in order to ‘influence,’ but also to divide Venezuelan society along various social and political lines. The Westminster Foundation for Democracy has already been identified as an organisation involved in activity within the Venezuelan parliament. Embedding its purpose in democracy and human rights rhetoric, and claiming to work ‘across the political divide,’ it has in fact worked entirely with the opposition Democratic Unity Roundtable (MUD) which consists mainly of right-wing parties including Popular Will whose leader Juan Guaido has proclaimed himself Interim President of Venezuela. Despite the UK Foreign Office imposing sanctions against Venezuelan leaders and accusing them of repressive and illegal behaviour, the Westminster Foundation for Democracy would have us believe it has been given the privileged job of instructing the political divide, the socialist government included, on how to legislate. What is more likely is that it has collaborated with the right-wing opposition of the National Assembly to undermine the government. Given that legislation is one of its stated objectives in working with the National Assembly, it is quite possible that the Westminster Foundation for Democracy has helped to construct some of the vehemently anti-government documentation produced by the National Assembly over the last couple of years. The judgments of the supreme court, dominated by the interests of the ruling party, have beaten venezuela’s democracy, undermine the rights of all citizens. For this reason, a group of civil associations decided to launch this digital project called “Supreme Injustice”, with the purpose of visualising the deviations of the Judiciary and to promote a debate that will contribute to improving justice in Venezuela. Meanwhile, it may be amongst their reports, but there is no noticeable reference to the Bank of England‘s piracy of Venezuelan gold, possibly due to the fact Transparencia Venezuela receives UK funding. 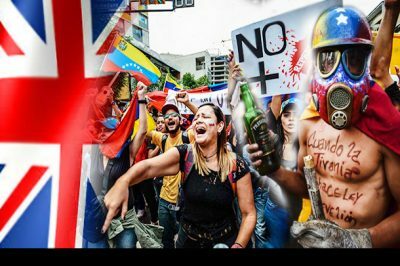 The fact this group has accepted UK funds during the build-up to the UK’s interventionist stance towards the Venezuelan government raises concerns, not just about the ethical behaviour of civil societies funded by Western governments but by the exploitative behaviour of the British Foreign Office. Transparencia Venezuela has received funds from a government hostile to its own and has provided narratives of corruption and repression now useful to its funders for regime change purposes. Vollmer is also head of the Venezuelan Council for Investment Promotion (CONAPRI) a recipient of UK ‘aid’ over recent years. Funded by the Foreign Office to build economic opportunity in Venezuela, its membership consists of multi-nationals, such as Shell, Nestle and IBM. The food and drinks conglomerate Empresas Polar, a subsidiary of PepsiCo, is also a member. It is the largest private company in Venezuela, and has been described as ‘having a hegemony’ over corn-flour production. It is owned by billionaire Lorenzo Mendoza and has been implicated for years in hoarding products and selling them through the black market, a scam called bachaqueo. The system has led to widespread shortages and a crisis for the poor while the corrupt wholesalers have made huge profits. But it is not just hoarding that Mendoza is implicated in: in 2015 he was heard in a leaked audio of a conversation with former politician, Ricardo Hausman, discussing possible intervention in Venezuela’s economy by the IMF. The IMF was rejected by Venezuela in 2007. Mendoza also considered standing against Maduro as an outsider in the elections last year. The members of CONAPRI, beneficiary of UK aid, form a group that would greatly benefit from the removal of the Maduro government. CONAPRI is a reality check for those buying into the Western propaganda that Venezuela is collapsing through the failure of socialism. It shows that the economy of Venezuela is basically a capitalist one that is tied to and influenced by global corporations and markets, despite its socialist programme. This is a problem for the Bolivarian revolution and an incentive for Western governments to drive their resource-hungry neoliberal agenda in Venezuela, an agenda that is now flagrantly interventionist. Another firm favourite of the Foreign Office in Venezuela is the anti-government media. Of those many anti-government press outlets in Venezuela, the Foreign Office has given funds to three, all of whom are promoting narratives supporting US pretexts for intervention and regime change. This is a media set up by journalist Luz Mely Reyes who won the 2018 International Press Freedom Award. During her acceptance speech she spoke of the fear she felt in 1992 when there was an attempted coup against the government of the day. This coup attempt was led by Hugo Chavez. Her position is openly partisan by virtue of the fact that he did not mention feeling any of the same fear during the massacring of Venezuelans shot dead under the right-wing government in 1998. It should surprise no one then that a journalist from a ‘civil society’ at least partly funded by Western governments, should win an award while claiming Maduro is a dictator, given the award is celebrated by the same Western governments who are actively trying to topple that government. But evidence soon came to light showing that supporters of Juan Guaido attempted to force lorries across the border into Venezuela, and that right-wing activists initiated acts of violence involving Molotov cocktails. Without providing any evidence, SNTP shares a message that implicates the Venezuelan government in the serious crime of kidnapping the journalist Daniel Garrido. Serious accusations of State-funded violence are being made by anti-government outlets, with reference also to paramilitaries. It is important to point out that there are many Colombian paramilitary groups in Venezuela and there is a history of right-wing opposition using paramilitaries for their political ends. The Instituto Radiofonico Fe y Alegria is an education network which runs radio and media courses, and also has an online media. This mirrors similar ‘opposition media’ operations launched by the US, France and UK against Syria, including BBC Media Action in Syria. On 23rd February it posted a string of tweets following the events that took place and the eruption of violence around the lorries. The tweets suggested government forces were carrying out needless attacks on people waiting for humanitarian aid. They did not mention violent groups that attempted to cross from the Colombian side, or the hail of rocks and Molotov cocktails launched at the Venezuelan national guard protecting the border. In addition, an article by Alegria y Fe about events on the 23rd February suggests that violent attacks and killings carried out in Ureña and Santa Elena de Uairen were by hooded thugs who follow Maduro. It ends with the notion that Maduro danced in the pool of blood. This is only one of many examples. Thus far, it seems that UK aid to Venezuela is designed to protect corporate interest, targeted at neoliberal organisations. It is also aimed at individuals and groups from the liberal establishment which are ideologically opposed to the Bolivarian revolution and to Chavism, enabling the UK to establish networks inside Venezuela to serve the interests of British corporations. UK aid to Venezuela has all the characteristics of a soft power tool kit, designed to expedite what is now a naked imperialist agenda. A simple look at UK aid going to Venezuela exposes the double standards of the UK government. Should we ever imagine that Russia might set-up shop half way across the world, or even inside UK Parliament under the pretext of ‘helping the Labour Party’ with legislation, or that Iran might fund the Morning Star which then supported China’s attempt to overthrow May’s government and install an unknown and unelected political actor to become PM – there would be deemed an international crisis. Yet, the British Foreign Office is doing exactly that; meddling with impunity in Venezuela, proving once more their ‘international rules-based system’ is a relative concept, or worse – a fiction and a fantasy that only exists for a tiny privileged group in positions of power, and simply a euphemism for supremacy.